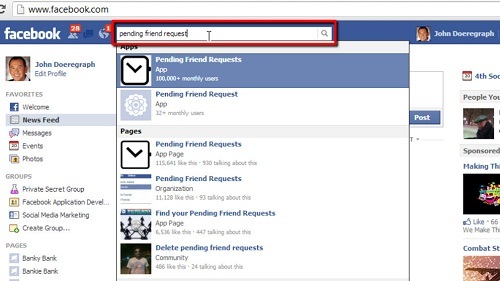 In this tutorial you are going to learn how to see facebook friend request sent. Navigate to Facebook and ensure that you are logged into your account. In the search box at the top of the window search for “Pending Friend Requests”. Click on the first option in the list that appears which should be an app. In the new page that loads click on the “Go to App” button and then click “Allow” on the following page. You will then be redirected to the main page for the app and you will need to load the relevant data by clicking on the “Bulk Load” button (it’s now﻿ called “Find Past Requests”). Click the “Get Friend Request Data” and in the window that appears copy all of the information, close the window, and paste the data it into the text box on the other page. Finally click “Load Friend Requests” and you will be redirected to the previous page where you will see a list of all the people you have requested the friendship of. This is the simple process for learning how to see facebook friend request sent.